The tulip is available in more than 100 varieties that can add varied color and aroma to your garden. Most tulips flower in early spring and can remain in bloom for some time. 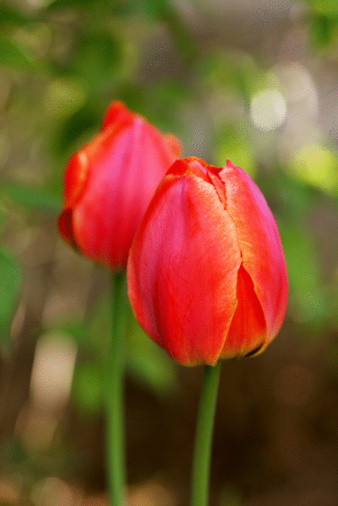 An unhealthy tulip may not flower, or it could gradually droop during the blooming season. To revitalize unsightly drooping tulips, you must pay extra attention to environmental conditions in your garden. Tulips will stay upright with proper care. Water your tulips daily. Tulips need only a small amount of water to survive, but they require this sparse water on a daily basis. Unlike some flowers, you cannot fully saturate the soil and wait for the tulips to consume the excess water. Supply just enough water from your watering can to barely moisten the soil. Add extra soil if the ground is loose. Tulips need densely packed soil to take root and thrive. To accommodate tulip root structure, extra soil does not need to be nutrient-rich, just well-packed. 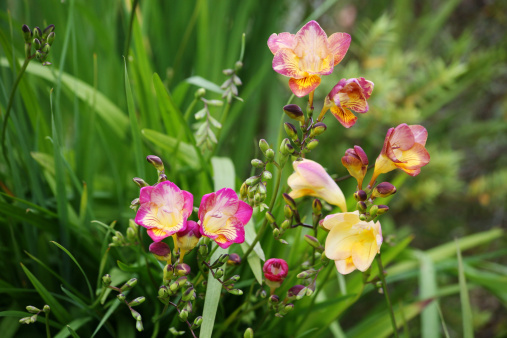 Dump additional gardening soil or heavy loam soil around the plant, then pack it with your hands. Continue to pack the soil until the ground is even, hard and you can no longer easily stick your finger into loose bits of soil. Cut off dead flowers as they appear. A drooping tulip is savable, but a dead flower should be snipped off with your gardening shears. Dead tulips will be discolored and no longer fragrant. Shelter your tulips from strong winds, as recommended by the American Horticultural Society. Tulips have rather weak stalks, and stalk strength diminishes further when the tulips droop. Some garden stores sell protective plastic domes to shelter your plants from inclement weather conditions. You can also plant hedges or erect a fence to limit wind damage in your garden. Dig up your tulips with a trowel and place them in indoor pots if you expect temperatures below 20 degrees. Tulips naturally die every winter, but a premature cold snap can cause excessive drooping or even plant death. The best way to prevent this is to monitor the weather and keep your plants indoors when necessary. Can You Plant a Kalanchoe Outside?